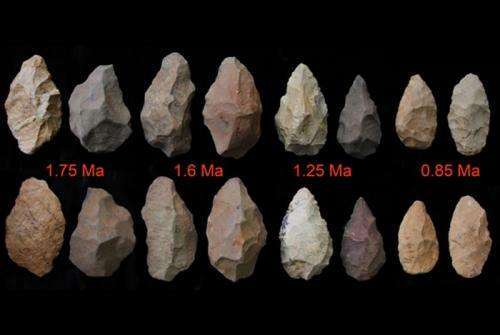 Ancient stone tools showing the pace of remarkable technological enhancements over time (1.75 to 0.85 million years ago). Credit: Los Alamos National Laboratory. (Phys.org) —Stone Age man's gradual improvement in tool development, particularly in crafting stone handaxes, is providing insight into the likely mental advances these early humans made a million years ago. Better tools make for better hunting, and better tools come from more sophisticated thought processes. Close analysis of bits of chipped and flaked stone from across Ethiopia is helping scientists crack the code of how these early humans thought over time. Los Alamos National Laboratory Fellow Giday WoldeGabriel and a team of Ethiopian, Japanese, American and German researchers recently examined the world's oldest handaxes and other stone tools from southern Ethiopia. Their observation of improved workmanship over time indicates a distinct advance in mental capabilities of the residents in the entire region, with potential impacts in tool-development skills, and in overall spatial and navigational capabilities, all of which improved their hunting adaptation. "Even though fossil remains of the tool makers are not commonly preserved, the handaxes clearly archive the evolution of innovation in craftsmanship, acquired intelligence and social behavior in a pre-human community over a million-year interval," said WoldeGabriel. The scientists determined the age of the tools based on the interlayered volcanic ashes with the handaxe-bearing sedimentary deposits in Konso, Ethiopia. Handaxes and other double-sided or bifacial tools are known as the first purposely-shaped tools made by humanity and are closely associated with Homo erectus, an ancestor of modern humans. A paper in a special series of inaugural articles in the Proceedings of the National Academy of Sciences, "The characteristics and chronology of the earliest Acheulean at Konso, Ethiopia," described their work. Some experts suggest that manufacturing three-dimensional symmetric tools is possible only with advanced mental-imaging capacities. Such tools might have emerged in association with advanced spatial and navigational cognition, perhaps related to an enhanced mode of hunting adaptation. Purposeful thinning of large bifacial tools is technologically difficult, the researchers note. In modern humans, acquisition and transmission of such skills occur within a complex social context that enables sustained motivation during long-term practice and learning over a possible five-year period. Researchers observed that the handaxes' structure evolved from thick, roughly-manufactured stone tools in the earliest period of Acheulean tool making, approximately 1.75 million years ago to thinner and more symmetric tools around 0.85 Ma or megaannum, a unit of time equal to one million years. The Acheulean is a stone-age technology named after a site in France where handaxes from this tradition were first discovered. The chronological framework for this handaxe assemblage, based on the ages of volcanic ashes and sediments, suggests that this type of tool making was being established on a regional scale at that time, paralleling the emergence of Homo erectus-like hominid morphology. The appearance of the Ethiopian Acheulean handaxes at approximately 1.75 Ma is chronologically indistinguishable from similar tools recently found west of Lake Turkana in northern Kenya, more than 125 miles to the south. "To me, the most intriguing story of the discovery is that a pre-human community lived in a locality known as Konso at the southern end of the Ethiopian Rift System for at least a million years and how the land sustained the livelihood of the occupants for that long period of time. In contrast, look at what our species has done to Earth in less than 100,000 years – the time it took for modern humans to disperse out of Africa and impose our voracious appetite for resources, threatening our planet and our existence," WoldeGabriel said. Bonobo stone tools as competent as ancient human? I've often thought that some of the stone age tools from thirty thousand years and a million years ago were distinguished by differrent ways of making them. One way was just taking the chipped flint themselves; the other way was a bit of a generalisation and maybe requiring solving certain geometric problems. If you take that first chip, and then make another chip, and then take that second chip and make another chip, but do it in such a way as to make a desired shape(whether a point or a curve of some kind), well, that is a remarkable mental ability for the times! -------------------physical anthropology has been making exciting discoveries latelly! "In contrast, look at what our species has done to Earth in less than 100,000 years – the time it took for modern humans to disperse out of Africa and impose our voracious appetite for resources, threatening our planet and our existence," WoldeGabriel said." It gets really, really old getting to the end of an otherwise interesting article and then having to read through what has become an obligatory jeremiad lamenting the essential evil, destructive nature of humankind. What a disgusting period in intellectual thought we seem to be going through right now. Also, I wonder if there might be some way to quantify how precise one's motor skills need to be to create/assess such axe-heads, and if that could somehow help us understand the development of the brain?? I assume since we're talking about vastly long ago there would be physical evolution going on to allow such skills, not just cultural/technological stuff. Interesting piece on what should be expectations. One would hope they'd gotten better over a million years. What I find interesting is the lack of data over what kind of stone tools were we using prior to figuring out how to flake them. We must have been using stone tools for millions of years before anyone struck on shaping them. Kind of disingenuous to compare how seven billion people use the Earth's resources with a time when there were at best 25,000 people on the planet. That doesn't say much for this guy's credibility. Give a scientist a platform and he will say the darnedest things. But yes, it is getting old. Our current "voracious appetite" for land is ~ 1/10 per person needs compared with the first farmers - those who struck down nearly all the continental forests. Our current "voracious appetite" for hunting is ~ 0 per person needs compared with the first hunter gatherers - those who struck down nearly all the remaining megafauna struggling with the end of the last ice age.